Parent education is such an important part of early intervention. 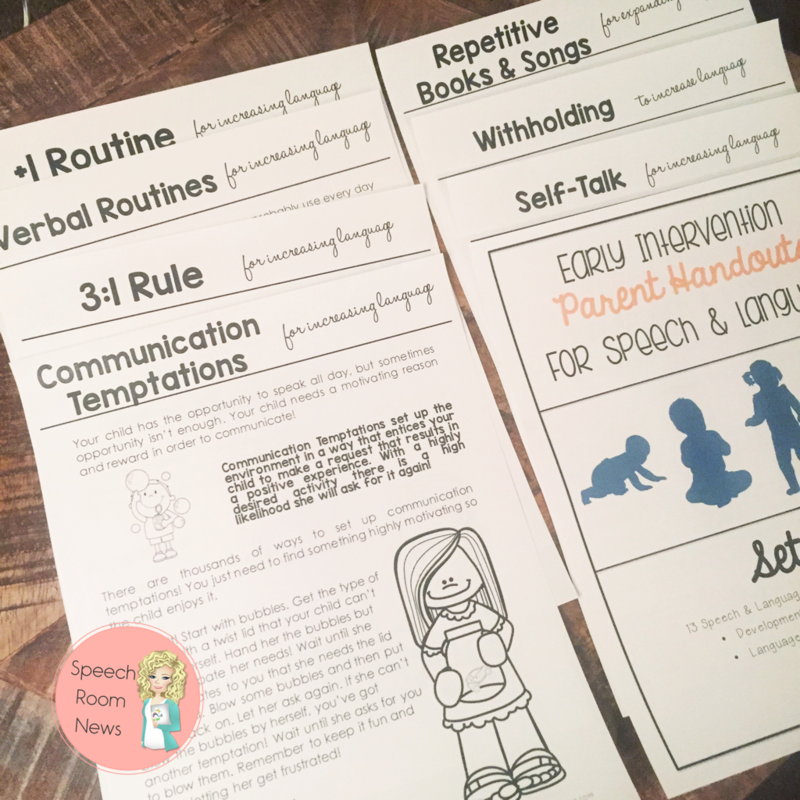 If you know me at all you know I love a good handout, so I’m excited to share with you some EI handouts for communication development. I try to remember that there is NO WAY a parent can remember all the advice I give, let alone share it with everyone else in the child’s life. It’s like when a I leave the orthopedic surgeon’s office and have already forgotten anything I didn’t write down. When you give a handout to stick on the fridge, the babysitter and grandma can also get a chance to learn the strategy! 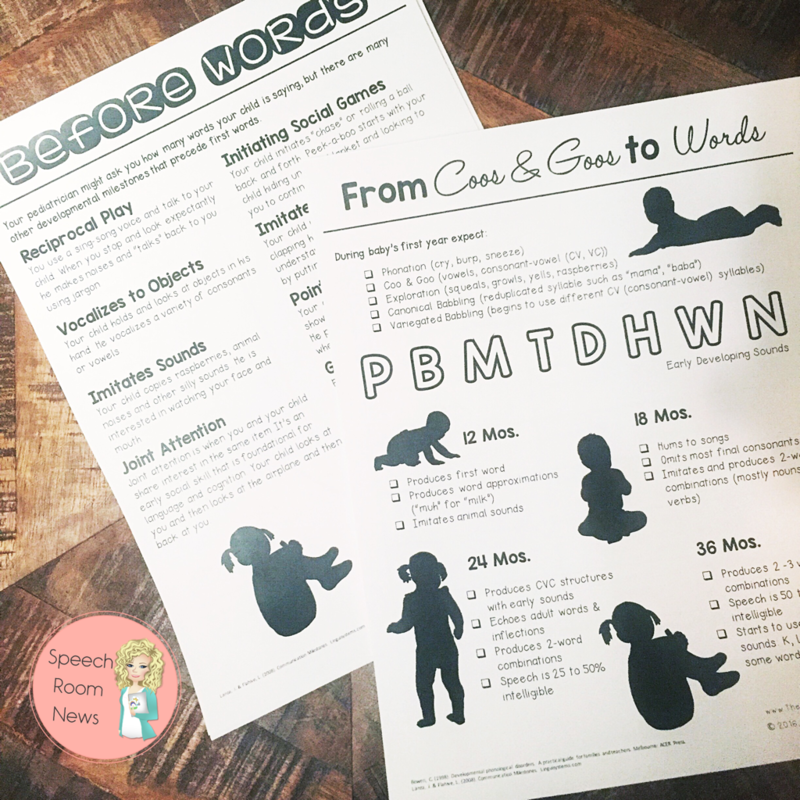 I shared some pictures recently of Early Intervention Parent Handouts and I can already tell you guys are needing these as much as I was! Right now, I work with about 10 preschoolers with significant delays and these parents needed handouts more typical of 1-3 year old communication levels. Their parents need to know what to work on besides imitating words! They need to know HOW to increase from 20 single words to 50. They need to know how to move from single words to 2-word phrases. 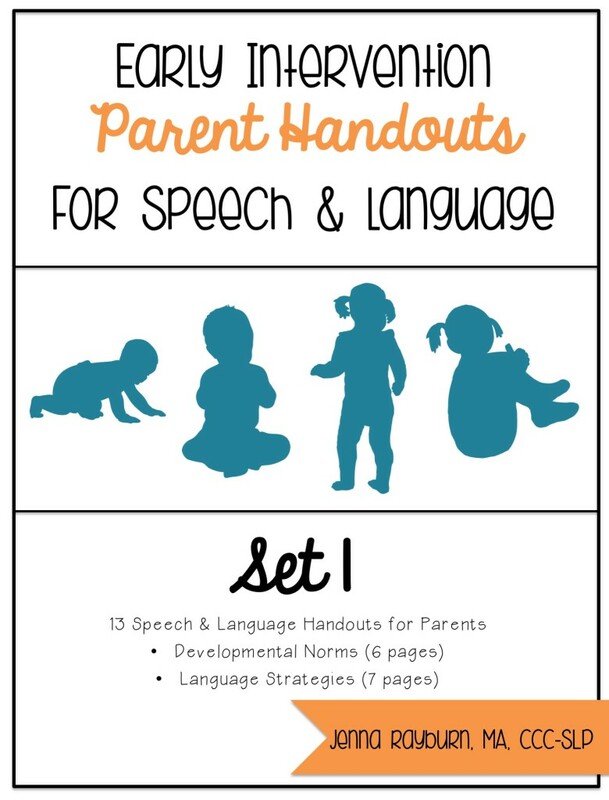 The packet has six sheets for developmental norms in several different areas including pre-verbal skills, speech sounds, language, word count, and literacy. 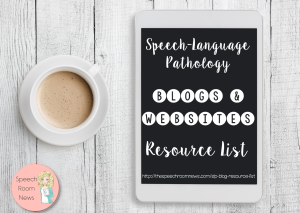 I also included seven of my most-used language strategies to eliciting or expanding language. These are all written in parent-friendly language. You can grab the handouts in my store for instant download. I tried to pick language strategies that I recommend the most. I’d love to hear what other EI handouts you need! Leave me a comment and I’ll try to make sure they get covered in set #2! To see all the Parent-Handouts I’ve made shop the Parent Handouts Category. It’s like you’re reading my mind! Products I wish I had but never could have put together as clearly and adorably! I work with preschool but the EI tips are still totally relevant! I would love to see some higher level stuff for preschoolers in the next packet! Thanks Hannah! You mean like the language strategies? Yes! Set 1 seems perfect for my lower preschool kiddos. I would love handouts for the students working on answering questions, following directions, sequencing etc. Hi Jenna. Would you ever consider having these and other parent handouts professionally translated into Spanish? I was just thinking the same thing! I have a lot of Spanish speaking parents that would benefit from these! I’m scared to let someone translate them because I can’t edit them myself! So I’d be publishing something under my name but not able to make sure it is done right! I’ll look around and see what I can find! I’d also have to do norms in spanish and I am not familiar with that! I want to second the request for Spanish translation. Is there a nearby university that could help? Some university programs have ELL programs for adults. That, or maybe a translation/interpretation firm… maybe a nearby PreK program with bilingual teachers or service providers. If your district works with bilingual SLPs or hires translators to help with assessments, they might also be an option. This is a huge need, and I’m sure the number of downloads would go up! Third request for Spanish interpretation. I NEED TO LEARN SPANISH! Hi there! I purchased these WONDERFUL handouts to give to parents of the kiddos I work with in Early Intervention, but on the last page I noticed it says “do not share with other SLPs, teachers, or parents. Please refer them to the SRN website.” Does this mean I can’t print them out to give to parents? You can share them with any of those people you listed! I mean please don’t send the whole packet for other other SLPs or Teachers to pass out to their caseload. Your purchase means you will share it with your caseload only. thanks for checking! Hi Jenna. Is it okay to include a handout in a general newsletter that goes home to all preschoolers in our school? I think these would be great to add one each time the newsletter goes out to the parents. Yes, Linda! You can hand it out to your school/caseload, just don’t share it with another SLP to do the same to her building! 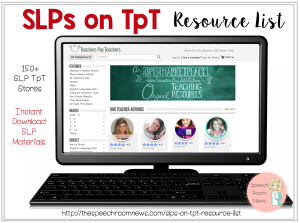 Any other SLPs you want to share it with can purchase an additional license at 50%! when I click on the link to buy these handouts I am told the page no longer exists. Can you send me a link to the handouts? Hi Jenna- I have downloaded these handouts and LOVE them. I use them with many of my families. 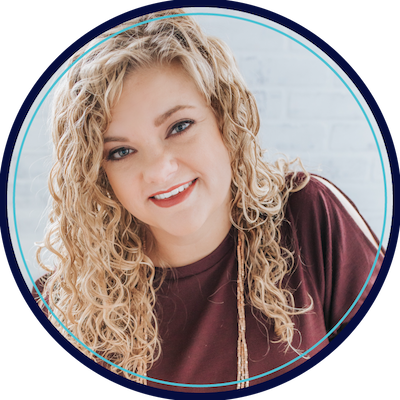 I am a bilingual SLP and my Spanish-speaking caseload is growing. I am wondering if you would be comfortable with me translating the text into Spanish. I would be happy to share my translations with you when I am finished. Thank you!